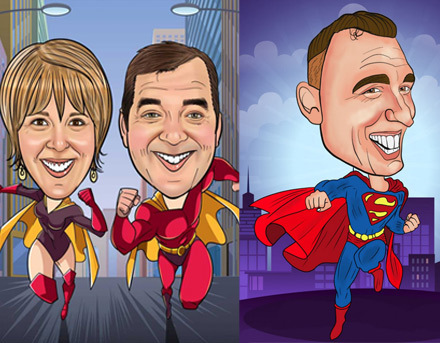 Justin's caricatures specialises unique bespoke gift caricatures offering a professional service. 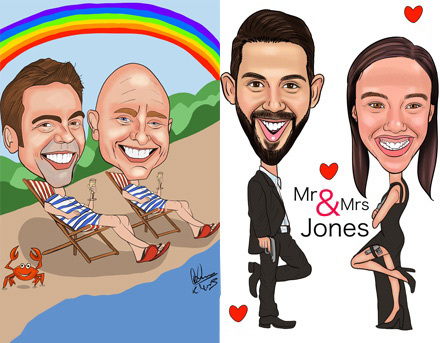 All the caricatures on my site are hand drawn by me only! All my caricatures get an amazing likeness and are printed out on Archival watercolour paper or canvas using pigment ink. My main aim is to create you a brilliant unique caricature! Register and join my site today and you will receive a 10% discount on your first order. 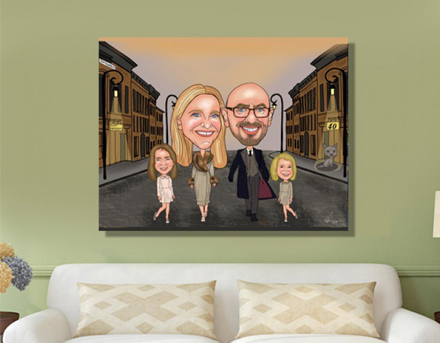 Perfect gifts for Birthdays, Family caricatures, Large groups, Retirement gift, Weddings and many more. My prices also include me sending you unlimited proofs until you are satisfied with your caricature drawing. Please send me clear photos, smileys photos are always best. Head & shoulders photos will be ok. Then include interests and hobbies and details to be included in your caricature. Then place your order on my site. As soon as I have finished your caricature I will email you a proof for your approval. Then your caricature will be posted out. Capturing moments with real live caricatures in York, I have over 25 years experience drawing in live entertainment. You can book me for Weddings, Corporate parties, Birthdays, Christmas parties and trade shows. 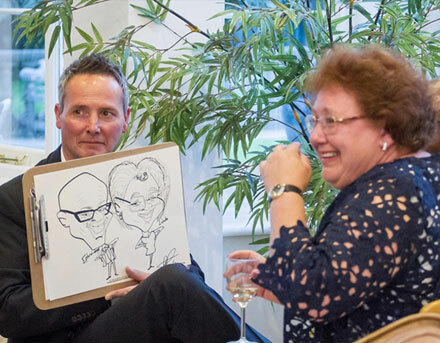 Caricatures make great live entertainment and will light up your special event. I have worked for many clients, which include the BBC, Virgin media, The Prince’s Trust, and many chain hotels, which include the Hilton. Call me now for a friendly quote on 07971 341 344.